Ameya: This is Talking Books from Juggernaut and the Indian Express. A show that brings you conversations with the best and brightest minds in India and takes you beyond books and into the world of ideas. Air pollution is becoming a bigger and bigger issue in our lives, especially in India. According to the World Health Organization’s global air pollution database, India has 14 out of the 15 most polluted cities in the world in terms of PM2.5 concentrations. Staying indoors is no help, the air is just as toxic inside as it is outside. 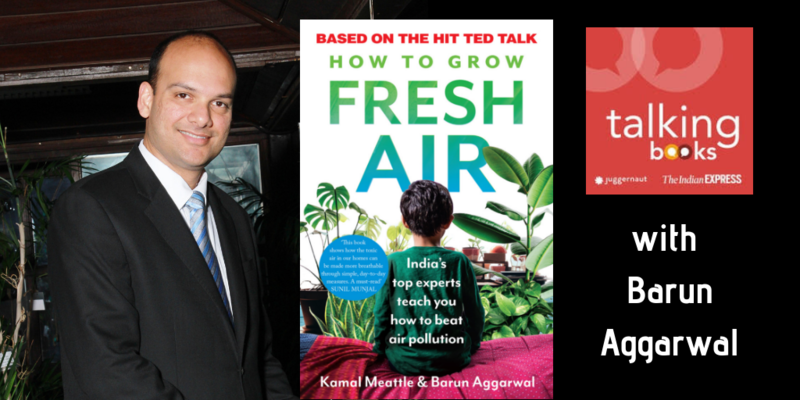 Today on Talking Books, I talk to Barun Aggarwal, air pollution expert and founder and CEO of Breathe Easy, about the gravity of India’s air pollution problem, what we can do to fight it, and how bleak our future will be if we do nothing about it. Hi, Barun, welcome to the show. Barun: Thank you for having me. Ameya: Barun, your book, which is very critical, How to Grow Fresh Air, is a book about how we can all look at air pollution and try to deal with it and combat it in our lives, right? Ameya: First, I’m going to ask you the obvious and stupid question, can you tell me the extent of the air pollution problem we face in India and possibly the world right now? How long has it been going on? What are the books to prognosis? Can you escape it by running away to live in command, for example? Barun: Those are some great questions. Again, thank you for having me on the show. Air pollution is a problem that is something that every single person has to deal with. It doesn’t matter what part of the social ladder you’re on, every single person is affected. In fact, unfortunately, the people at the lower end of that ladder are impacted even more because they can’t afford to put in solutions to fix the problem as a band-aid solution temporarily also. The problem is huge, I call it a national health emergency. We have a problem and I have graphic maps, unfortunately, we can’t show that on this show, but we have graphic maps which show the extent of the problem of air pollution from a health perspective and how death is linked to air pollution and what those numbers look like for different countries of the world. One map of the US shows various parts of the US in blue which is good and various parts in light pink and some spots of red. When you then open the map of India which relates to the same impact of PM2.5 and related to death, it’s all red with The Indo-Gangetic belt being in a deep maroon. We have a huge problem and the problem is not just restricted to the large metropolitan cities of Delhi, or Bombay, or Bangalore, as a lot of people tend to believe. When you look at the map of India, the air pollution shade for Northern India starts from Pakistan and ends in Bangladesh. The entire Northern region of India, even some of the higher altitudes unless you go very very high, are very hugely impacted with particulate matter and air pollution. It’s not just particulate matter, we actually have a problem of many other pollutants which are still completely people are unaware of, starting with ozone pollution in the summer to hydrogen sulfide in Noida because of the open nalas and how copper pipes from air conditioners get corroded, imagine what happens to our lungs. You have these kinds of problems across the entire country and the causes are many. We have to start dealing with each and every cause and not just take one particular issue and try and deal with it. The health impact is tremendous. It’s not just something that impacts your lungs and it’s not just something that has a short-term impact and you’re coughing, and your nose, “I get a little cold and I’ll recover from it.” These are long-term health impacts that you have. When you breathe in particulate matter, and these are ultra-fine particles, so small that they are invisible to the naked eye. They are going not only deep into our lungs but they are going deep into our bloodstream as well. When it goes into the bloodstream, it starts impacting every organ in the body. Particulate matter is known now. There is enough research, enough scientific evidence to prove that particulate matter causes stroke, causes ischemic heart failure, causes our lungs, kidneys, liver, our reproductive system to get damaged. It impacts the baby before birth. That’s how critical particulate matter is. Like I said, again, it’s a national health emergency that we need to wake up to and realize. In other countries when the outdoor PM2.5 levels are starting to approach 50, which is the limit for other countries for outdoor air pollution, 50 micrograms per cubic meter, they start to take action to say, “It’s starting to get close to 50. It’s hitting 30. It’s hitting 35. What do we need to do so that it never hits the limit of 50 and we start controlling it now. Here in India, our national average for Delhi, for example, is 153 and our government and our so-called caretakers of this problem say that our goal is 60 micrograms but not the limit. Our goal should be zero, get the pollution as close to zero as possible, but we are happy saying, “We are 153 and we are working towards getting it close to our goal of 60,” but they don’t realize the goal is not 60. The goal is zero. The limit is 60. Anything above 60 in other countries is declared an emergency. Cities are shut down, schools are shut down when it’s above 60. Here we’re celebrating on a day when it’s between 60 and 120 because that’s a good day for us. Ameya: That certainly puts it into perspective for sure. How long has this problem been going on though? It feels like we’ve been shouting about it in Delhi for the last few years, but, surely, it’s not recent. Barun: I’ve written this book with Mr. Kamal Meattle and he is a known environmentalist in the circles and he started working on this problem of air pollution in the early 1990s. His lung capacity had gone down and his doctors told him that he needed to leave Delhi, and being from a prominent industrial family of Delhi it was hard for him to leave. He was on the board of IIT at the time. During a board meeting at IIT, he asked them what they could do to help him fix the problem of air pollution either in his home or his office, and that’s when the whole solution started coming up. They asked him what the budget was, he said, “There was no budget for living or dying. Whatever it took let’s do it.” They put a team together of the heads of department and they started understanding the problem. Back in ’92, 1992, which is a long time ago when nobody even ever heard of air pollution, they imported some of the best equipment in the world to measure the different pollutants that are in the air. The PM2.5 measuring equipment from TSI, one of the most impressive pieces of equipment is called DustTrak. They imported that back in ’92 to understand how severe is the problem. They learned that not only is PM2.5 a problem but even benzene levels were very high. We learned that the petrol that was produced in India was produced with 5% benzene and he figured that it was possible for our refineries to make petrol with 1% benzene. Public interest litigation was filed, and finally, in the year 2000 the Supreme Court passed adjustment for all our refineries to produce petrol with 1% benzene. A lot of work has gone on in the background to try and fix the air of the city and of this country but there’s still a long ways to go. Ameya: I do wonder when did they actually implement that 1% finally? Ameya: The ruling was in 2000? Barun: Refineries were able to do it very easily. Ameya: Immediately, okay. Normally, there’s usually a serious lag then. Barun: With regards to upgrading the fuel quality from Euro 3 to Euro 4 and now from Euro 4 to Euro 6 because we are skipping Euro 5 altogether, there is a big lag time, there is a huge investment of 80,000 crores but the conversion for benzene from 5% to 1% was much simpler and easy to implement. Ameya: Clearly, this is a very long-standing problem that we’re only waking up to now. Do you think we’re waking up to it now because we physically see the smog? How many of us have actually been thinking we’re okay all this time but, actually, we’re not? Barun: Even today a lot of people think that, “We grew up in this. It’s been like this forever. We’ve got immunity built because we grew up in these conditions. Foreigners come to India and they fall sick whereas we stay strong and we are okay.” Completely not true and very quickly I’ll explain this. Dr. Arvind Kumar, a leading lung surgeon of India, worked with AIIMS for 35 years and now is at Sir Ganga Ram hospital, he explained it to me very simply. He said, “Barun, God has given us two organs for most of the parts of our body except the heart and the tongue, which is for good reason we have one of those. Same with the lungs, we have two lungs and we have 70% more lung capacity than what we need to live a normal life. Until 70% gets damaged, most of us don’t even feel the impact of air pollution on our lungs, but once 70% is damaged then it’s irreversible and you get too serious problems with regards to pulmonary issues and other issues for the whole body. Do you want to wait till you get to 70% because you just don’t feel the impact of it? Or if you can do something about it now, A, from an outdoor perspective, and B, till we can fix the outdoors something from an indoor perspective, why wouldn’t you do it for yourself, for your children, for your family. Ameya: That’s interesting. I suppose we should all rush off and have our lung function testing. Barun: Absolutely, this is something we do regularly. Barun: Regular lung function test. Something even more simple is a little device that you can put on your finger and through an infrared light, it detects your blood oxygen saturation level. Ameya: They do that in hospitals, right? Barun: Exactly. Every time you get admitted they’ll put that on your finger and it’s tracking your heart rate and your blood oxygen saturation levels. If your blood oxygen saturation level comes down to below 95, that’s an indicator for you to go and get your lung function test done because it’s not processing enough oxygen to send to your brain. Ameya: Okay. That’s something I must definitely explore. Moving on a little bit, what can you tell me about large outdoor changes that can be made, that need to be made? What’s the timeline for these things? How would it work if you want to try and fix this? Barun: From an outdoor perspective, I believe that if the right political will is there and the will to execute a plan is there, a plan to fix the problem can be put in place fairly easily. There are broadly three to five categories that I would focus on. Number one, and most important, I would focus on waste management. We don’t have a waste management system in India. We have a waste transportation system. It just goes from one place to the other and eventually ends up in a landfill and gets burnt. We have 7,000 metric tons of capacity for landfill in Delhi and we’re producing 11,000 tons of waste every day in Delhi, just the city of Delhi. 4,000 tons of waste extra is typically burnt every single day in the city of Delhi and we don’t even realize it. It’s in the air. We are breathing it. We don’t know what we are breathing. The number one, and according to me, one of the most critical ones, would be waste management. The second issue is with regards to coal-fired power plants. Coal-fired power plants are huge emitters of particulate matter and gases which end up converting into secondary pollutants in the air. The shade of air pollution that coal-fired power plant create is actually very very large. We have close to five, to six major power plants within a 50 km radius of Delhi. Fixing those in terms of the raw material they use or converting them to perhaps cleaner energy power plants is something that is critical. Third, which I believe the Supreme Court has already started it’s work on, is converting our fuel because we have so many automobiles in India. Changing our fuel from the current Euro 3 and Euro 4 standards to Euro 6 standards or Bharat Stage III and IV standards to Bharat VI standards. I believe the Supreme Court has already mandated that all of the country should have Bharat Stage VI fuel by 2020 which is much better than the earlier mandate of 2025, but I’m skeptical. I believe the City of Delhi is the first city to have already received Bharat Grade VI fuel, but the rest of the country is slated to get that by 2020. Ameya: Yes. I have always wondered the odd-even approach to regulating private cars. It’s never made sense to me because I don’t think private cars are India’s problem. Barun: Scientifically, we have proven, when you do run the math of odd-even, you take all the exceptions out in terms of women drivers, C&G cars, this car, that car, taxis are allowed. Actually, if I have two vehicles with different numbers, chances are if my wife needs a car a home and I have to go to work, I’ll go to work, I’ll send the car back home for her to do what she needs to do, I’ll call the car back to work, versus one car going to work and staying there, and she’s doing what she needs to do with the second car. The number of miles doesn’t change. In fact, it may even increase in that particular instance. When you run the overall math on odd-even, it actually doesn’t work. Ameya: What are the small things or the more within the reach of an individual, things that I can do around the evolution combating it or escaping it in my daily life? Barun: That’s what this book is mostly about. We have outlined the problem. We’ve outlined what some of the big issues are in terms of where the problem comes from, and what needs to be done from a policy perspective, but at the end of the day, as an individual, I have to take care of my family. I have a responsibility towards my family and my children, and I’ll do anything to provide them a safe environment, whether that’s safe drinking water or safe food or safe air to breathe. For that I need to take certain measures, and as much as I environmentally understand that it’s not the best to add more product in a home and in every home, which will then have filters that are going to come out and go into the landfill, but temporarily I have to do that to protect my children. I call it a band-aid fix. Till I can fix the problem outside, till my government can fix the problem outside, I need to do something to protect myself, and my children, and my family. There’s plenty of things that you can do. Some of the most simple things are as simple as your proper housekeeping procedures. Just a simple minimize clatter, have a very strict regimen for housekeeping in terms of cleaning and cleanliness around your house, takes you a long way in terms of production of pollutants. That’s a very small part. It’s not something that’s going to fix the entire problem. That’s a very small part of it, but after that, you want to make sure that your space has decent windows and doors so that when it closed you don’t have a lot of leakage coming inside and outside. Then you can install plants indoors. There are certain air purifying plants that are very good for you, which produce oxygen indoors, remove carbon dioxide and other volatile organic compounds, but unfortunately, plants by themselves will not be enough to remove the huge levels of particulate matter and other gases that we had. Then you would need to have some sort of an air purifier. We’ve listed out a few because in the business, we’ve tested so many or pretty much, I would say, every air purifier that’s on the market, and we found that a lot of them are actually very average to poor in performance. The good ones is what we’ve listed out in the book and we know that they work really well. That’s what we have in our home, and in a lot of our friends and family, and customers’ homes, and we know that really work. Just to give you an idea, on Diwali night in our building, in the Paharpur Business Centre in Nehru Place, which is one of the more polluted parts of Delhi, last year during Diwali, the outdoor PM2.5 levels were about 1,900 micrograms per cubic meter. Barun: Yes. The visibility is very poor on the morning after Diwali, because of that fog, or the smog, or the smoke that is there. People call it fog. I correct them and say smog, but it’s actually more smoke and less fog. Inside our building on that day, all the readings were less than 15 micrograms per cubic meter. In my home, that entire night of the Diwali it was under 10 micrograms per cubic meter when outside was close to that 1500, 1900 micrograms per cubic meter. I have been able to create a safe environment for my family. I’ve done that for thousands of other families in Delhi, and other parts of the country, and it’s possible. Unfortunately, it is something that only people who can afford to put solutions like that we’ll put in. The ones who can’t afford it will have to breathe the problem. They will have to face the consequences of the problem, and someday our government will have to give us an answer on that because the economic burden of not fixing the problem is so huge in terms of health cost, in terms of lost revenue from a tax perspective. That it’s better for the government to actually do something than not from an economic perspective. Forget the health angle. Economically, which typically drives governments. If you don’t do something about this problem, economically they’re worse off. Ameya: It needs to be economics and public perception. Those are the two you need. Barun: Absolutely. That’s what I say. We have to make this into an election issue. The day this becomes an election issue, our politicians will wake up and say, “Okay. It’s an election issue. To win, I need to talk about this and I need to do something about it.” That’s when, hopefully, that five-year horizon will go away. Then say, “Okay. Let me do something. At least it will show that I did something so that the next election, even if I don’t get results, I did something.” That’s what’s required. Ameya: Okay. Well, thanks so much Barun for your time and for totally terrifying me. [laughs] We encourage our listeners to read the book. It’s called How To Grow Fresh Air and it’s out with Juggernaut Books. To find out more about what you can actually do in your daily life about this problem. Of course, in terms of larger things, if you can make a noise. I would say, talk to your local representative but it doesn’t really work like that in India. Just try to vote at least and try to work for people who are aware of the problem and are trying to fix it. Thanks, Barun. This is Talking Books from Juggernaut and the Indian Express. If you like the show, please subscribe on iTunes, leave us a review, shout it from the rooftops. Anything you can do to get the word out. You can tweet us and find us on Facebook, @expresspodcasts, and on the web at indianexpress.com/audio.